Kratos, an organization that specializes in building revolutionary and portable power outlets, recently announced its decision to launch an IndieGogo campaign for its latest product in August. In 2014, two university students created the ATOM, which is now being hailed for its groundbreaking technology. The ATOM boasts several impressive features that help the user utilize power in an efficient manner. The charger’s 30000mAh, rugged, and safety-tested battery provides just the right amount of power needed for the day’s activities. 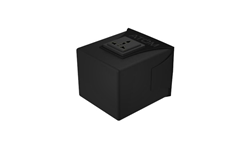 Additionally, the ATOM’s universal power outlet allows users to charge any device without the use of adapters. With the device’s rapid USB charging, iPhones can be charged in under an hour. According to an article available on the product’s website, the ATOM was designed with power and longevity in mind. Its creators, Luv Sheth and Avinaash Venkatasubramanian, added a unique heat dissipation mechanism to the ATOM, which allows it to operate close to peak efficiency and ensures that no energy is wasted. The ATOM also guarantees the safety of devices being used by powering them through pure sine waves. ATOM’s team plans to unveil more key features of the product leading up to the IndieGogo campaign in August. Individuals interested in learning more about ATOM can visit the company’s website for additional information. Readers are also encouraged to view the promotional video for ATOM to learn more about the product.